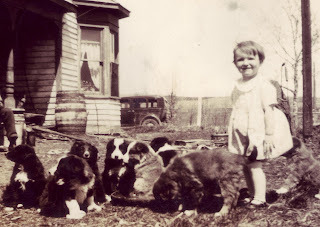 My mom had dozens of cousins. You run the risk of that sort of thing if you have a proliferation of aunts and uncles and my mom had aunts and uncles aplenty. One uncle followed his fathers fine example and (almost) singlehandedly produced ten children. Ten cousins for my mother... and there were eight more assorted aunts and uncles all doing likewise. When the dust settled, there were several dozen cousins wandering in and out of Great Grandma and Grandpas farmhouse. When you have that much going on, what difference would a batch of puppies... or two make?